Last year we announced the launch of local news in the U.S., and later in the UK, India, Canada and Germany. 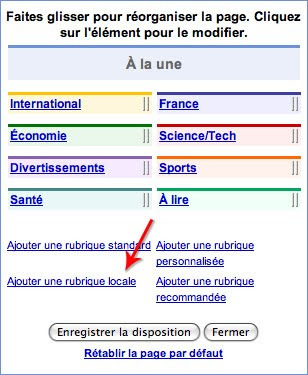 Today we're delighted to let you know that we're making this feature available for France. The Local news section lets you keep track of current events in your area. Once implemented, the top stories for a given area will be at the top of your results, and our rankings also take into account a publication's location to promote local sources for each story. We work hard to improve our algorithm, including its ability to understand the relevant locations for a news story and the location of the source that reports a story. We also train our algorithm to detect when a news article is reporting about a particular location and when it's not. The city of Paris (also a world celebrity) has proven particularly challenging in this respect. How can I add Local News to my Google News homepage? Once you've clicked on this local section link, you'll see a place to enter a postal code or city. Use the drop-down menu to choose the number of stories you'd like to see. 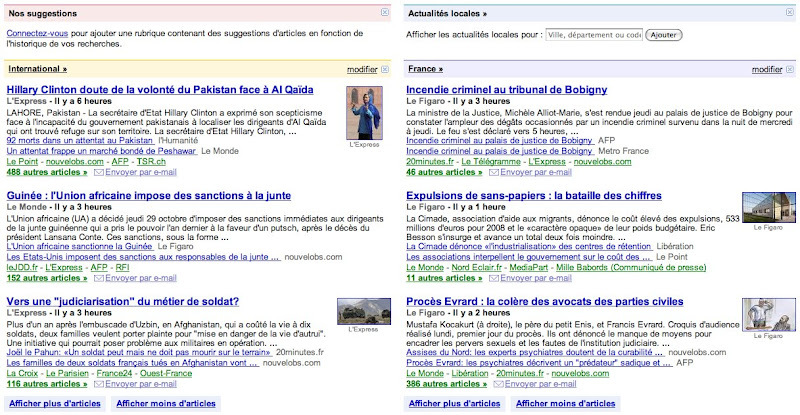 Once you click "Add Section" you'll see this section on your personalized Google News page. As always, we're always working to improve our product, and appreciate your feedback.